You know you can get sick from stress and worry. Did you know your pets can also get sick from stress and worry? Most people think pets only get stressed from being hungry, being left alone, or being punished. But that isn't true. They also tune in to YOUR feelings and get stressed when you're going through a rough time. 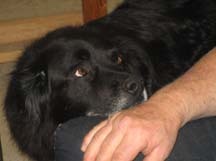 A friend told me recently that when she's sick, one of her dogs hovers - stays right by her side and "fusses" over her. The other one hides. Both of these animals are reacting to her feelings, each in his or her own way. And both are feeling stress because the person they love is under the stress of illness. Pay attention to your pets. Are they behaving differently these days? If you're worried about a job loss, an overdue mortgage payment, an illness, or even an emotional rift with a loved one, your pets are feeling it. Keep an eye on them, and if you see behavior changes, treat them with Bach Flower Essences before their stress causes a physical ailment as well. Most of the time, Feel5ive will do the trick. But just to be on the safe side, use Feel Bach's questionnaire designed just for pets. It will help you choose just the right combination of Bach flower essences to help your most loyal friends through this difficult time.